Renting an apartment on Lanzarote has always been a popular summer option. In recent years though the island has changed its image considerably. Although the resort beaches and nightlife remain popular, Lanzarote is keen to promote its culture and its spectacular volcanic attractions. 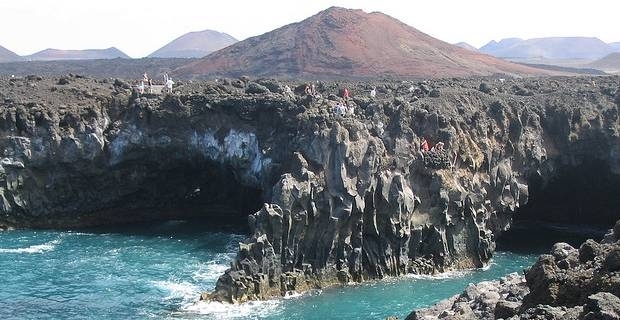 Its geological formations make Lanzarote one of the most memorable of the Canary Islands. Once you've checked into your apartment, Lanzarote and its exotic landscapes will offer plenty of attractions to explore for the duration of your stay on the island. For an introduction to the turbulent volcanic history of Lanzarote, the bus tour around the lava fields of the Timanfaya National Park is ideal. The eruptions of the 18th century added a substantial volcanic tail of land to Lanzarote. At the end of the tour, you can grill a sandwich or cook a pizza over the volcanic furnace at the visitor centre. That idea was one of many formulated by the late Lanzarote genius Cesar Manrique. This innovative artist and architect worked with the volcanic landscape to create weird and wonderful constructions. One the east side of the island, Manrque landscaped the Jameos Del Agua caves in the lava flow from the volcano of La Corona. They now form a concert hall with amazing acoustics, along with bars and nighclub spaces. Guided tours take visitors into the tunnels and underground volcanic pools in La Cueva De Los Verdes, a grotto lit with amazing rock formations and stalactites. Beyond the volcanic attractions, the town of Puerto Calero is a relaxed resort with excellent restaurants. For something a little more brash, Puerto Del Carmen is the loud and lively resort beloved of younger British tourists. When booking an apartment on Lanzarote, look for accommodation that is away from the main areas of bars and nightclubs. Puerto Del Carmen in particular can get very noisy at night. It's better to get a taxi home after a night in the clubs than be kept awake all night by the relentless beat.